Zurich, Switzerland, March 1, 2012: Adecco Group, the worldwide leader in Human Resource services, today announced results for the full year and Q4 2011. Revenues in 2011 were EUR 20.5 billion, an increase of 10% on an organic basis. The gross margin was 17.4%, down 60 bps year-on-year organically. Strong cost control resulted in only a 4% organic increase of SG&A in 2011. EBITA increased 14% organically compared to 2010, while the EBITA margin was 4.0%, up 10 bps year-on-year. The Group generated strong operating cash flow of EUR 524 million in 2011. The proposed dividend per share for 2011 is CHF 1.80, an increase of 64% compared to the dividend paid per share for 2010. The results of the acquired business of Drake Beam Morin Inc., (“DBM”) are included since September 1, 2011. Group revenues for 2011 were EUR 20.5 billion, an increase of 10% or 11% in constant currency compared to the prior year. Organically revenues were up 10% in 2011. Permanent placement revenues amounted to EUR 344 million, an increase of 20% in constant currency (+18% organically). Revenues from the counter-cyclical career transition (outplacement) business totalled EUR 206 million, a decline of 6% in constant currency or 16% organically. In 2011, gross profit was EUR 3.6 billion, an increase of 7% compared to 2010. Organically, gross profit increased by 6%. The gross margin was 17.4%, 40 bps lower than in 2010. Acquisitions added 20 bps to the gross margin in 2011. The negative impact from the French payroll tax subsidy cut was mitigated during 2011 through price increases, so that the impact at the Group level was negligible for the full year. SG&A increased by 6% compared to 2010 or by 4% organically. Integration costs for MPS and DBM amounted to EUR 20 million in 2011 (EUR 33 million for MPS and Spring in 2010). At year end 2011 the Adecco Group had over 33,000 FTE employees worldwide and a network of over 5,500 branches. Compared to year end 2010, on an organic basis, FTE employees were up 3% and branches were up by 1%. In 2011, EBITA improved by 13% to EUR 814 million. On an organic basis, EBITA increased by 14%. The EBITA margin was up 10 bps to 4.0%. Amortisation was EUR 51 million in 2011, compared to EUR 55 million in 2010. Operating income in 2011 was EUR 763 million, compared to EUR 667 million in 2010. Interest expense was EUR 71 million in the period under review, which compares to EUR 63 million in 2010. Other income / (expenses), net was an expense of EUR 6 million in 2011, compared to a net expense of EUR 1 million in 2010. Interest expense is expected to be around EUR 80 million for the full year 2012. The effective tax rate for 2011 was 24% compared to 30% in 2010. The tax rate for 2011 was positively impacted by the reduction in withholding tax payable upon the distribution of dividends due to the ratification of the Swiss-Japanese tax treaty. The successful resolution of prior years’ tax audits in several jurisdictions in both years also positively impacted the tax rate. In 2011, net income attributable to Adecco shareholders was EUR 519 million (2010: EUR 423 million). Basic EPS was EUR 2.72 (EUR 2.20 in 2010). Operating cash flow amounted to EUR 524 million in 2011. The Group invested EUR 148 million for DBM and EUR 109 million in capex in 2011. Dividends paid were EUR 149 million in 2011. Net debt at the end of December 2011 was EUR 892 million compared to EUR 751 million at year end 2010. In 2011, DSO was 55 days compared with 54 days in 2010. In 2011, currency fluctuations had a negative impact on revenues of approximately 1%. Group revenues in Q4 2011 were EUR 5.2 billion, an increase of 4% in EUR and in constant currency compared to Q4 2010. Organically, revenues were up 3%. Permanent placement revenues increased 7% in constant currency to EUR 82 million, while revenues from the counter-cyclical career transition (outplacement) business totalled EUR 64 million, a decline of 6% organically. In Q4 2011, gross profit amounted to EUR 930 million and the gross margin was 17.9%, flat compared to Q4 2010. DBM added 30 bps to the gross margin this quarter. The temporary staffing business had a negative impact on the gross margin of 40 bps in Q4 2011. Permanent placement had a positive impact of 10 bps on the Q4 2011 gross margin, whereas the impact was +30 bps from the career transition business (neutral when excluding DBM). Sequentially, the gross margin was up 70 bps (+50 bps excluding DBM). SG&A in Q4 2011 amounted to EUR 713 million, an increase of 4% in EUR and in constant currency or 1% organically compared to Q4 2010. Sequentially, SG&A was flat on an organic basis and when excluding integration costs. Costs related to the integration of DBM totalled EUR 12 million in Q4 2011 (EUR 12 million for MPS and Spring in Q4 2010). Organically, FTE employees increased by 3% (+950), compared to the fourth quarter of 2010. Sequentially, the number of FTE employees organically was unchanged. On an organic basis, the branch network expanded by 1% (+65 branches) compared with Q4 2010. In the period under review, EBITA was EUR 217 million, up 3% in EUR, in constant currency and organically compared with the fourth quarter of 2010. The Q4 2011 EBITA margin was 4.2%, flat compared with Q4 2010. Amortisation of intangible assets in Q4 2011 was EUR 11 million compared to EUR 14 million in Q4 2010. In Q4 2011, operating income was EUR 206 million. This compares to EUR 197 million in the fourth quarter of 2010. The interest expense amounted to EUR 20 million in the period under review, EUR 5 million higher than in Q4 2010. Other income / (expenses), net was an income of EUR 3 million in Q4 2011 compared to an expense of EUR 1 million in the fourth quarter of 2010. In the period under review, net income attributable to Adecco shareholders was EUR 133 million. This compares to EUR 141 million in Q4 2010. Basic EPS in Q4 2011 was EUR 0.71 (Q4 2010: EUR 0.73). In Q4 2011, currency fluctuations had no impact on revenues. Revenues in France amounted to EUR 1.5 billion, flat compared to Q4 2010. Revenues were flat year-on-year in the industrial staffing segment, still running against a high comparison base and further slowing from the 7% growth rate in Q3 2011, while professional staffing continued to grow double-digit. Permanent placement revenues were up 22%. In the quarter under review EBITA was EUR 62 million compared to EUR 57 million in Q4 2010. The EBITA margin was 4.3% in Q4 2011, up 40 bps compared to Q4 2010. The good performance in renegotiating client contracts meant that Adecco in France recovered around 90% of the negative impact from the payroll tax subsidy cut for the full year 2011, ahead of initial expectations, so that the negative impact on the FY 2011 French gross margin was less than 10 bps. In order to further strengthen the Group’s position in France and to ensure sustainable profitability, Adecco is informing and consulting the French Works Councils on its plans to unite the networks of Adecco and Adia under the Adecco brand. Combining the expertise of both general staffing businesses under a single roof would facilitate an even better offering for clients, candidates and colleagues. At the same time, the cost base would be further optimised through the planned reduction of over 500 full time equivalents (FTEs) and further branch network and shared service centre consolidation. Adecco expects to invest approximately EUR 45 million, the majority of which would be incurred during the second half of 2012. 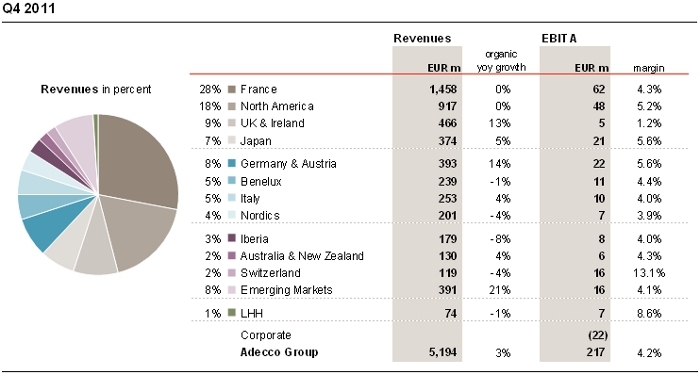 In North America, Adecco generated revenues of EUR 917 million, flat in constant currency compared to Q4 2010. General staffing revenues grew by 2% in constant currency. Professional staffing revenues declined by 2% year-on-year, held back by the IT staffing business and with the Engineering & Technical segment comparing against very strong growth in Q4 2010 (Q4 2010 +36% organically vs. Q4 2011 -1% in constant currency). Finance & Legal and Medical & Science continued to report positive growth. Whereas the profitability in the IT professional staffing business was strong, revenue developments remained short of expectations. In the quarter under review, permanent placement revenues increased by 14% in constant currency. EBITA was up 21% in constant currency to EUR 48 million. The EBITA margin was 5.2% up 90 bps compared to Q4 2010. Note that integration costs related to MPS amounted to EUR 8 million in Q4 2010. In the UK & Ireland, revenues were up 13% in constant currency to EUR 466 million, driven by new client wins. Permanent placement revenues were up 5% in constant currency. Business in the public sector, which accounted for 10% of the revenues in the UK & Ireland, continued to be difficult. EBITA was EUR 5 million in the quarter under review and the EBITA margin was 1.2%, up 10 bps compared to Q4 2010. Integration costs related to Spring and MPS amounted to EUR 4 million in Q4 2010. In Japan, revenues increased by 5% in constant currency to EUR 374 million. The EBITA margin was 5.6%, up 60 bps when compared to Q4 2010. Adecco in Japan continued to benefit from outsourcing contracts won in 2010 and 2011. At the beginning of January 2012, Adecco acquired VSN Inc., a leading provider of professional staffing services in Japan. VSN Inc. doubles the exposure to professional staffing of Adecco in Japan and reinforces Adecco’s strong position in this attractive structural growth market. Results of VSN Inc. will be included as of January 2012. In Germany & Austria, revenue growth continued to be solid and ahead of the market. Revenues increased by 14% to EUR 393 million, or by 17% when adjusted for the fewer working days in Q4 2011. The industrial staffing business continued to grow double-digit. The office segment grew 3% and professional staffing was up 15% year-on-year. EBITA amounted to EUR 22 million and the EBITA margin was 5.6%, as anticipated impacted by fewer working days in the fourth quarter of 2011 compared to the same period in 2010. Additionally, salary increases in accordance with the collective wage agreement and effective as of November 2011, impacted profitability in Q4 2011 due to the time lag of renegotiating client contracts. This will no longer have a negative impact in Q1 2012. In Q4 2011, revenues in Benelux decreased by 1%. Revenue development was slightly behind the market in the Netherlands, but ahead of the market in Belgium. The EBITA margin was 4.4% in the quarter under review. Revenue growth in Italy slowed to 4% in Q4 2011, comparing against a quarter with very strong growth in 2010 of 35%. Demand was also impacted by the economic uncertainties in the country. Italy achieved an EBITA margin of 4.0% in Q4 2011, down 90 bps year-on-year. Revenues in the Nordics were down 4% in constant currency. Revenue growth in Sweden was still positive in Q4 2011, while revenues in Norway declined year-on-year, both in constant currency. The EBITA margin in Q4 2011 was 3.9%. In Iberia revenues declined by 8% as economic conditions in the region remained difficult. Revenues in Australia & New Zealand were up 4% in constant currency this quarter with a very solid EBITA margin of 4.3%, up 160 bps compared to Q4 2010. In Switzerland revenues declined by 4% in Q4 2011 in constant currency, while profitability remained stellar with an EBITA margin of 13.1%. Emerging Markets continued to deliver very strong revenue growth of 21% in constant currency. The EBITA margin was 4.1%, up 80 bps compared to the prior year. Revenues of Lee Hecht Harrison (LHH), Adecco’s career transition and talent development business, were EUR 74 million, up 32% compared to Q4 2010 in constant currency and down 1% organically. EBITA was EUR 7 million and the EBITA margin was 8.6%. Results of the acquired company Drake Beam Morin Inc. (DBM) were included for the full quarter. In Q4 2011, integration related costs for DBM were EUR 12 million. Initially targeted synergies of EUR 10 million will be exceeded. With a deeper understanding of the DBM organisation, more cost savings have been identified mainly related to additional branch network optimisation potential. Total synergies of EUR 20 million are now targeted and are expected to be fully realised by the end of 2012. For Q1 2012, integration costs are expected to amount to approximately EUR 3 million. Adecco’s revenues in the General Staffing business (Office & Industrial) increased by 3% in constant currency to EUR 4 billion. Revenues in the Industrial business were up 2% in constant currency. Revenue growth in Germany & Austria remained strong, up 15% year-on-year. In France revenues were flat in Q4 2011 and Italy slowed to 4%, after several quarters of strong double-digit revenue growth. Revenues in North America declined by 6% in constant currency. In the Office business, revenues increased 5% in constant currency. In Japan revenues were up 5% and in North America revenues increased by 12%, both in constant currency. In the UK & Ireland revenues were down 2% and in the Nordics down 9%, both in constant currency. Revenues in France declined by 8%. The Professional Staffing4 revenues increased 4% in constant currency. Germany & Austria and France continued to deliver double-digit revenue growth. Also, UK & Ireland grew double-digit in constant currency in Q4 2011, mainly driven by good developments in IT. Revenues in North America declined by 2% in constant currency. In Information Technology (IT), revenues increased 8% in constant currency. In North America, revenues declined by 8% in constant currency. On the other hand, revenues in the UK & Ireland developed strongly, increasing double-digit in constant currency, driven by a few larger project wins. Adecco’s Engineering & Technical (E&T) business was up 2% in constant currency. Growth continued to be solid in Germany & Austria and France with revenues up 11% and 18% respectively. In North America, revenues declined by 1% year-on-year, compared to a very strong fourth quarter last year, where revenues increased by 36% organically. In Finance & Legal (F&L), revenues were down 1% in constant currency. Revenues in North America increased by 5%, while business in the UK & Ireland remained difficult, resulting in a revenue decline in Q4 2011 of 11%, all in constant currency. In Q4 2011, revenues in Medical & Science (M&S) were flat in constant currency. In the quarter under review, revenues in Solutions5 were up 25% in constant currency and up 1% organically, mainly still impacted by the counter-cyclical career transition (outplacement) business. Year-on-year revenue growth continued to soften during Q4 2011, albeit compared against a strong fourth quarter in 2010. In January 2012, Adecco Group revenues were down 1% compared to the prior year, on an organic basis and adjusted for trading days. Within Europe, revenue growth in Germany & Austria remained double-digit in January 2012. Most other countries slowed further going into the new year. In North America, revenues were up slightly year-on-year in January 2012, adjusted for trading days, while revenue growth in the Emerging markets continued to be healthy. The Adecco Group is solidly positioned for the future. In an environment of economic uncertainty we will continue to build on our strengths – our leading global position and the diversity of our service offerings. We will continue to take advantage of growth opportunities, with a strong focus on disciplined pricing and cost control to optimise profitability and value creation. Besides the structural changes and related investments of EUR 45 million in France, which would mainly be incurred in the second half of 2012, management expects additional costs of EUR 10 million in the first half of 2012, to further optimise the cost base in other European countries and to protect profitability. We are committed to our strategic priorities and we have the right offering to achieve our EBITA margin target of above 5.5% mid-term. On February 8, 2012, Adecco S.A. placed a 4-year CHF 350 million bond with a coupon of 2.125%. The notes were issued within the framework of the Euro Medium Term Note Programme and are traded on the SIX Swiss Exchange. The proceeds are for general corporate purposes. Given Adecco’s solid financial position and strong cash flow generation, it was decided to increase the pay-out range from the Group’s traditional payout range of 25-30% to 40-50% of adjusted net earnings. This range is seen as sustainable going forward. At the Annual General Meeting, the Board of Directors will propose a dividend of CHF 1.80 per share for 2011, for approval by shareholders. This represents an increase of 64%, compared to the dividend paid for 2010 and is equivalent to a payout ratio of 45% based on adjusted net earnings. The total amount of the dividend distribution for 2011 is intended to be paid out of the capital contribution reserve, and is therefore exempt from Swiss withholding tax. The dividend payment to shareholders is planned on May 8, 2012. The Board of Directors proposes Dominique-Jean Chertier to be elected as a new member of the Board of Directors for tenure of one year ending at the next Annual General Shareholders’ Meeting. Dominique-Jean Chertier (1950) is a French national. He obtained a doctorate degree from Sorbonne University, France. Since 2011 he has been Deputy CEO of Safran Group (France), an international high-technology group with three core businesses: aerospace, defence and security. Dominique-Jean Chertier had been Executive Vice-president of Safran Group from 2003 to 2011. From 2002 to 2003 he was Social Advisor to the French Prime Minister. From 1992 to 2002, he held the position of Chief Executive Officer at Unedic (French unemployment insurance). Dominique-Jean Chertier has been a member of the Board of Directors of Air France since 2004 and he was Chairman of POLE EMPLOI (French employment and unemployment national agency) from 2008 to 2011. The Adecco Group, based in Zurich, Switzerland, is the world’s leading provider of HR solutions. With more than 33,000 FTE employees and over 5,500 branches, in over 60 countries and territories around the world, Adecco Group offers a wide variety of services, connecting around 700,000 associates with well over 100,000 clients every day. The services offered fall into the broad categories of temporary staffing, permanent placement, career transition and talent development, as well as outsourcing and consulting. The Adecco Group is a Fortune Global 500 company. 1 Organic growth is a non US GAAP measure and excludes the impact of currency and acquisitions. 2 EBITA is a non US GAAP measure and refers to operating income before amortisation of intangible assets. Solutions include revenues from Human Capital Solutions, Managed Service Programmes (MSP), Recruitment Process Outsourcing (RPO) and Vendor Management System (VMS).